Babymoons are all the rage, the last chance to elope before you are at the beck and call of a demanding tiny person. The trouble is, you are hormonal, prone to a whole heap of not-so-nice pregnancy symptoms, and you want to make sure that you make the best choices for your baby in terms of where you go and when you travel. To help, we have gathered some essential tips to help you make a seemly simple decision easier at this special time. Babymoon staycation. 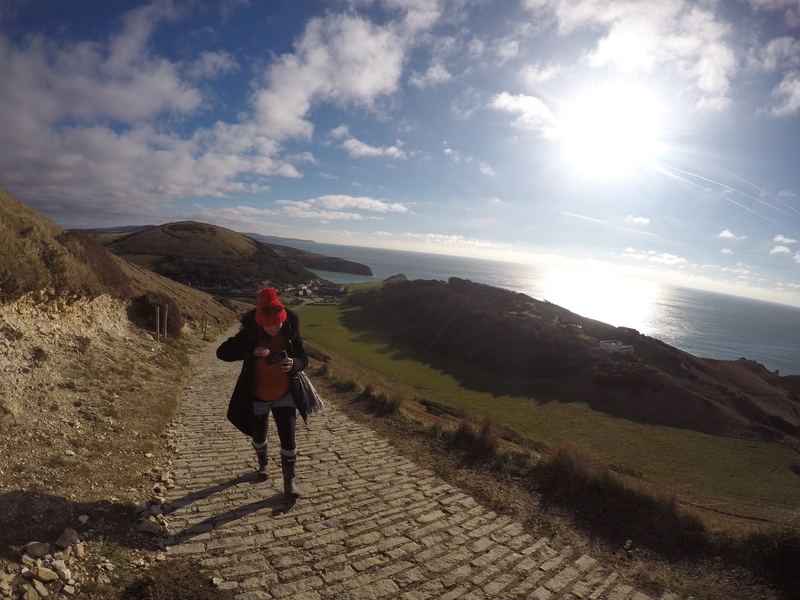 Taking it easy on the steep coastal path from East Lulworth to Durdle Door in Dorset, 28 weeks pregnant. This is because you are most likely over your initial nausea, and yet not so far along that you are uncomfortable, or could give birth at any minute. This applies to long distance car journeys, flying, travelling by boat, and by train. If you are fit and healthy, and were pre-pregancy, the chances are you can take on a 5k hike at 28 weeks. The key is to take it easy – now is not the time to push yourself! Knowing that you can reach an NHS hospital easily if you needed to offers a pregnant lady priceless peace of mind – no matter how many weeks gone you are! Plus, the point of a babymoon is about spending some undivided time together before baby is born, not necessarily about the holiday itself. You can travel by ferry until you are 32 weeks pregnant, BUT..
Do check with the ferry company before booking as they may have their own restrictions in place. Never wear a safety belt over your bump, always have it under, and ensure the cross-strap is between your breasts. If you are the driver, make sure that you take regular breaks during the journey, and keep fresh air circulating. Not if you are carrying twins, in which case you must travel before 32 weeks, and if you are experiencing a high risk pregnancy, you should consult a medical professional first. As with ferry travel, check with the travel provider before booking as they may have their own restrictions or require a doctors note. Changes in air pressure and humidity, along with the slight increase in radiation have been deemed unharmful, however, swelling in legs, motion sickness, and of course the risks associated with deep vein thrombosis are all worse in pregnancy. Whether in the UK or abroad, having your notes in a bag that you are carrying is essential in case you go into labour prematurely or you are experiencing anything that you feel requires medical attention. Vaccinations are considered unsafe while pregnant as they may affect the baby in the womb. This may mean that some destinations are off the agenda – check with your local clinic before booking a holiday! Diarrhoea can lead to dehydration which is not good for an unborn baby. Make sure that food and drinks are “safe”, and if you do get an upset, seek medical help rather than buying over the counter treatments – these could be harmful to take during pregnancy. Long journeys will need to be broken up for toilet breaks, leg stretching, bump swinging, eating and drinking. Plus, bear in mind that when you are heavily pregnant, staying in one position for any length of time is incredibly uncomfortable! The EHIC is a must, but bear in mind that it does not cover every eventuality – travel insurance is much more comprehensive, so needed even if you are staying within the EU. If you are going further afield, then you’d be incredibly foolish to travel without it! This entry was posted in Safety when travelling, Travel Advice on November 13, 2015 by worldwideinsure.